Quite simply the most cost effective means of storing large volumes of hard copy documentation in the minimum amount of space. Compared to fixed shelving, the same volume of storage in a mobile shelving system, can take up only half the footprint, releasing 50% of your floor space for other business uses. 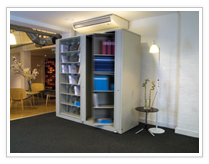 To make use of smaller areas around the office, mobile shelving is also available in push-pull or slide aside option. All systems are fully modular. A high density fast retrieval rotary filing system. 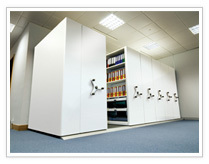 Imagine two lateral filing cabinets placed back to back on a rotating base. The unit revolves, presenting a second side of filing while the operator stands still. Thus floorspace is saved since only one access point is required. Units are quick to install and easy to add to, making them a popular choice for many public sector bodies and blue chip companies where filing is continually growing, and office churn demands that configuration of units will regularly change. 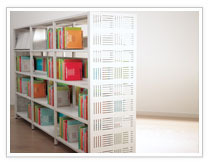 Our Aspire Library Shelving, designed and manufactured in the UK, is a firm favourite with designers and architects. From Universities and Local Authorities, to prestigious Law Firms; the possibilities to customise with colour, wood or corporate graphics, is endless. 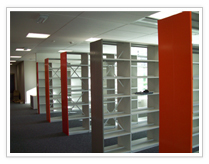 Our Library Shelving is cost effective and will bring a touch of finesse to both traditional and contemporary interiors. In the current climate this service is very much in demand. Where offices are expanding or consolidating, and therefore storage units need to move to another part of the building (or indeed to another building entirely) FILOR Engineers will undertake the relocation either within or outwith office hours, to ensure there is no disruption to staff. New end panels may be added to give systems a fresher more modern aesthetic in their new location. In the instance of mobile shelving FILOR will ensure your equipment is inspected, tested and certified to comply with PUWER regulations (Provision of Use of Work Equipment Regulations 1998). We can offer one off servicing of machines and mobile shelving or arrange a service contract to suit your specific needs. 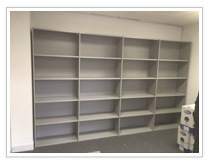 Filor supply economical fixed steel shelving to fit any purpose in the workplace. 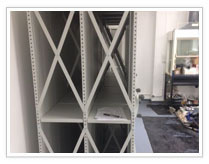 Whether a few bays of shelving in a mail room for temporary storage of high turnover items, or a large heavy duty racking solution for a warehouse or archive facility. Filor Safes are specifically designed to withstand all that a major fire or security breach can inflict. 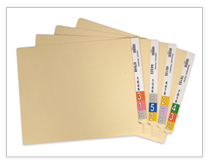 A variety of sizes of document safe are available with a wide selection of interior accessories. 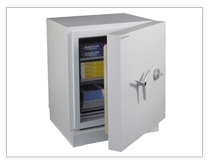 FILOR safes are available with one or two hour fire protection.